READY FOR AN UNWIND MINI-RETREAT? Let's do this right from the beginning and keep it super simple. Do you need a mini-retreat from your stress? Do you want a path to peace of mind? WELCOME TO THE UNWIND® RETREAT. 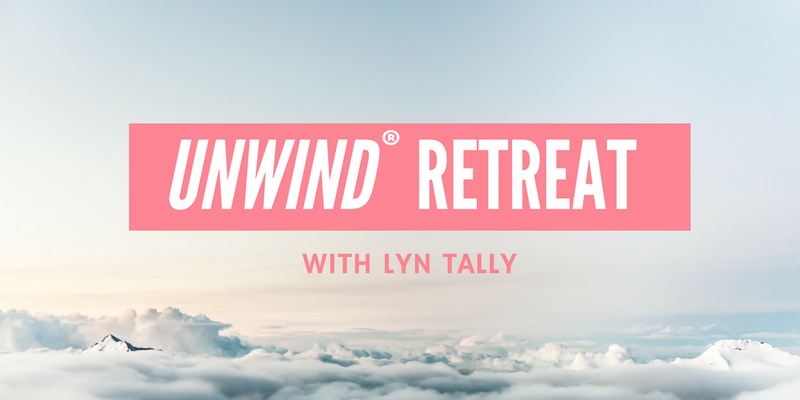 Learn from mindset coach and energy therapist, Lyn Tally, the most effective strategy to unwind from your typical stress response & re-engage with clarity, ease, and peace of mind. "I don't have enough time in my day"
"I wish I could slow down, but there is no way because I won't get everything done"
... the UNWIND Live retreat is for you! Joining the retreat, you are choosing to join a movement of life-long learners shifting their mindset around stress using a simple method combining mindfulness and deep-relaxation techniques. Interested? Let me tell you more. The UNWIND® method teaches you how to apply techniques immediately in your real life! Where do I even begin with my stress? It feels overwhelming. What exactly do I need to do to ease my mind? Meditation does not work for me. Capture control over stress by knowing the difference between good vs. bad stress. Understand how to use mindfulness to catch bad stress and quickly shift to ease. Reconnect to the focused single-task method of productivity rather than the exhausting multi-tasking mindset. Identity the five common areas of life where stress dwells and learn how to shift it for one’s happiness and well-being. Discover the five elements where one is personally impacted by stress and create an individual plan to increase its positive effects. Learn how to effectively utilize the method of UNWIND throughout a 24-hour day cycle and enhance one’s overall health, decrease unnecessary fatigue, and feel vibrant.